As previously announced by the carrier, Verizon's 5G Home service has gone live in four markets, with limited areas of Sacramento and Los Angeles, CA; Houston, TX; and Indianapolis, IN. able to sign up for in the initial rollout. Verizon is offering three months for free, then the service will cost $50 per month for existing Verizon subscribers, $70 for everyone else. 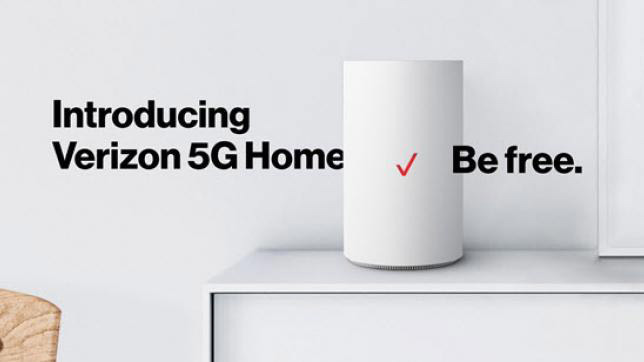 Running on Verizon's "proprietary 5G standard," 5G Home is similar to a typical home broadband service, with Internet access provided via a single router, albeit one that uses the carrier's cellular network instead of a physical connection. Speeds of around 300 megabits per second are touted, rising to nearly gigabit speeds in some areas, seemingly with no data caps. To sweeten the deal for early adopters, customers can request either a free Apple TV 4K or Chromecast Ultra, provided at the time of installation, as well as three free months of YouTube TV access. Those signing up are also to receive "white glove installation" of the service, a 24-hour concierge line, access to the first wave of 5G-capable mobile devices when they become available, and free hardware upgrades when they become available in the first year. The latter point is likely to be very beneficial to customers, as Verizon is using its own version of 5G for the service, rather than an industry standard variant. As the iteration used will only communicate with specialized devices, in this case 5G Home routers, when the company migrates to standard 3GPP 5G NR technology for future installations in new areas, hardware upgrades are likely to be offered to the earlier customers. The rollout of the service will also help Verizon in expanding its 5G network in general, which will provide high-speed connectivity for future smartphones and other mobile devices. While Verizon does claim the title as the first of the U.S. operators to produce a commercial 5G network with their 5G Home product, it is likely that subscribers will have to wait until 2019 before they can receive the same speed benefits from their smartphones.